If you know me, you know that I cannot go to London, see freshly roasted coffee from someone I trust and not buy it. So, when I went to Harrods and the guy at Andronicas told me that in the Harrods Food Hall I could buy freshly roasted coffee, I ran down with my son and bought two 250 bags of coffee, one was Mocha Italia and the other Mountain Blend. 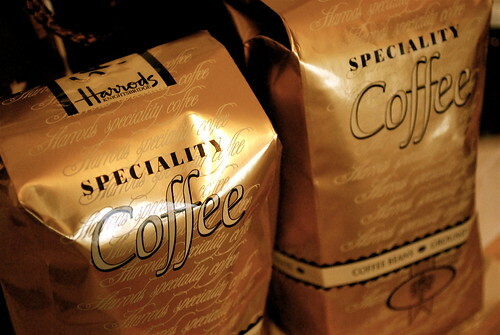 A word of caution – when you go to the Harrods Food Hall, look for the counter stacked with gold coloured tins of coffee, which should contain coffee beans, freshly roasted by Andronicas and supplied once a week to Harrods. If you peep over the counter and look at the back, you will see the original bags from Andronicas as if to confirm the coffees are viable. I mention this word of caution, because you can also buy Harrods Coffee from beautiful designed tins, which will be already ground. Yes ! these tins look nice and good to give as presents, but for coffee geeks, this coffee might not be up to the standard, so go for the good, and buy the fresh stuff from the speciality counter. I also want to add Harrods have about 5 cafes, including the Andronicas World of Coffee cafe on the 4th floor, which I recommend. 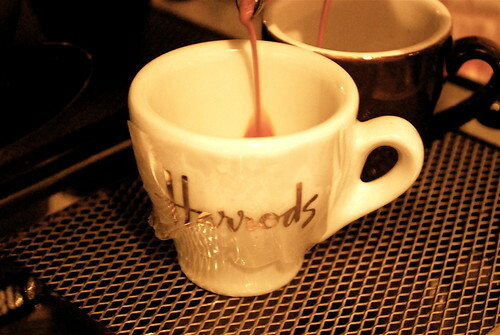 In any case, I promise to do a “Drinking coffee in Harrods” post one of these days God willing. I started with the Mountain Blend, which as far as I can remember from the sales assistant had a mix of Central and South American coffees. I found it sweet with caramel undertones and although it was fine for an espresso, I preferred it as a milk based espresso drink like a Cappuccino and Caffe Latte, where I find the caramel taste really compliments the milk. 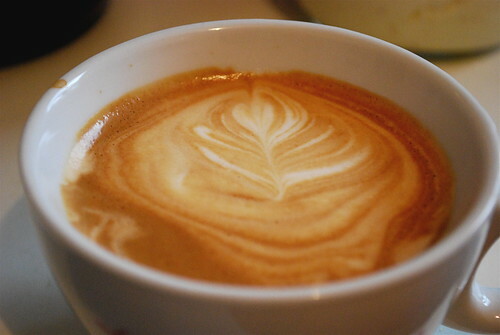 On tasting the Mocha Italia the exact first impression was wait for it….”nice”. OK ! what does that mean Lameen ? It was full bodied, glossed my tongue, went down right and made my tummy tingle – does that make sense or does that make me sound “bean” crazy ? OK ! Mocha Italia is exactly what is says. It has a mocha or chocolate taste and definitely reminds me of drinking coffee in a typical Italian cafe. To finish off, this coffee, extracted as an espresso had a nice thick brown crema, keeping the sugar on top for a few seconds before sinking in. I’m going to have to give Harrods my “best place to buy really fresh roasted coffee in a Department Store” award because the other department stores I’ve been to did not sell freshly roasted coffee and the coffee from Harrods passes the test for freshnest, courtesy of the guys from Andronicas of course. 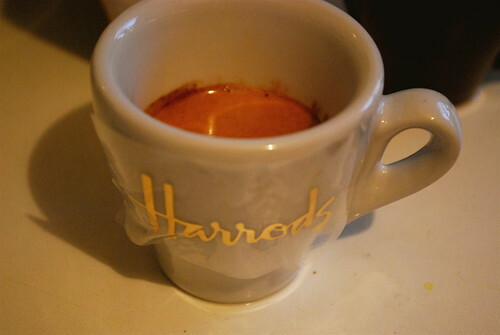 This entry was posted on Friday, January 23rd, 2009 at 6:56 pm	and tagged with Andronicas, Beans, Harrods, Italian, london, Mocca and posted in Bean Talk - Coffees, I'm Drinking. You can follow any responses to this entry through the RSS 2.0 feed. Actually Asma it wasn’t that expensive you’ll be pleased to know. The coffees I bought were on average £5 per 250g bag, which is standard and cheaper and tastier than from Starbucks, etc. Sure, they have more expensive ones but you can get a standard good freshly roasted arabica for under £5 per 250g, so don’t be scared, try it out.